Kaycie- 2016 NTX 5K — Just for J, Inc.
At just 6 weeks old Kaycie suffered a massive brain bleed and right Hematoma stroke due to lack of Vitamin K in her body. This led to emergency surgery and a craniotomy (removal of skull) to allow the brain to swell. This also resulted to a touch and go month stay in the hospital. In the last year and a half we have been through 3 more brain surgeries, an eye surgery, and a hydrocephalus diagnosis, all to say that Kaycie Paige is beating what all the doctors told us she would or could not be doing. Our sweet girl loves so big, gives the best hugs and kisses, and laughs at anything her sister and brothers do. She tries so hard to accomplish the biggest of things, and our next big goal is to get miss priss walking... We are so close! She attends therapy twice a week, working on left side coordination and milestone type development. For the most part with a smile, but we all have our bad days! 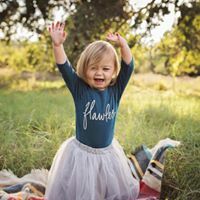 It is an honor to be her mommy, what seems like such a little or normal accomplishment to other moms of toddlers is a huge celebration in our household, and I am so honored God chose me to be able to witness His goodness daily. From sitting up, to standing, to something as little as holding a cup with both hands, IT'S A BIG DEAL FOLKS! She is our miracle baby! Follow Be Brave, Kaycie Paige!! !